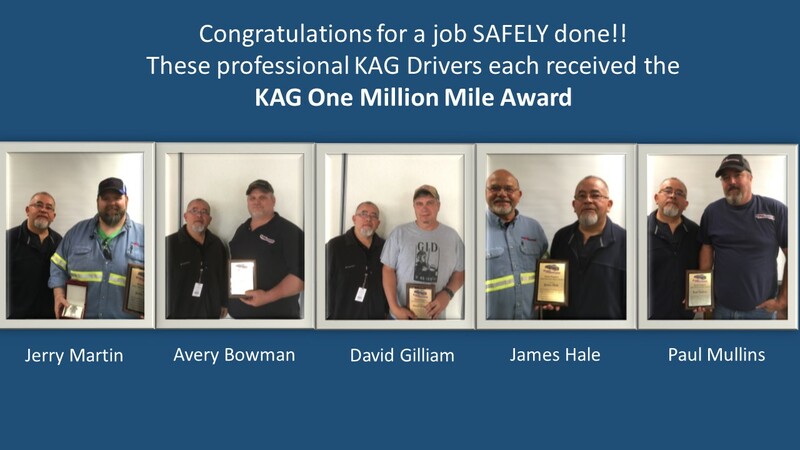 Congratulations to five of our Knoxville, TN KAG Drivers who recently received the KAG One Million Mile Award. This prestigious award is given to Drivers for accumulating one million safe, accident-free miles driven. Each day Jerry Martin, Avery Bowman, David Gilliam, James Hale and Paul Mullins demonstrate KAG’s uncompromising commitment for the safety of their fellow employees, customers and the general public. We thank you for your dedication and your professionalism.